Under Spanish rule, the following detailed caste system was instituted in Mexico at one time. Today, in San Miguel status is not conferred by race (well, that is another post). Status is conferred through a Cachet System. If you possess the right Cachet then you have status but without Cachet you are no-one. 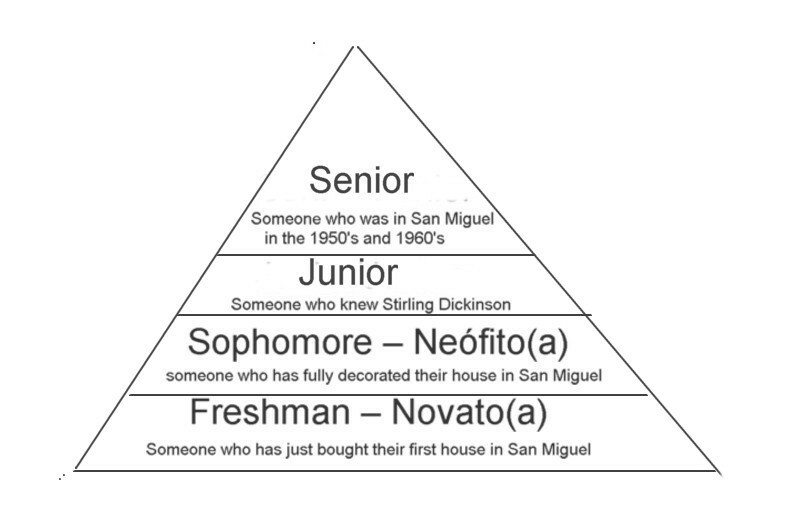 To understand the various Cachet Systems in San Miguel it is easiest to start with a Caste System based on a known Cachet. Think of status being conferred like it was in high school or college. Cachet in this system is simply time and ownership. The minimum Cachet in this system is owning a house or condo. Without home ownership you don’t even qualify to be a Freshman. You are simply known as a Renter or a Tourist. 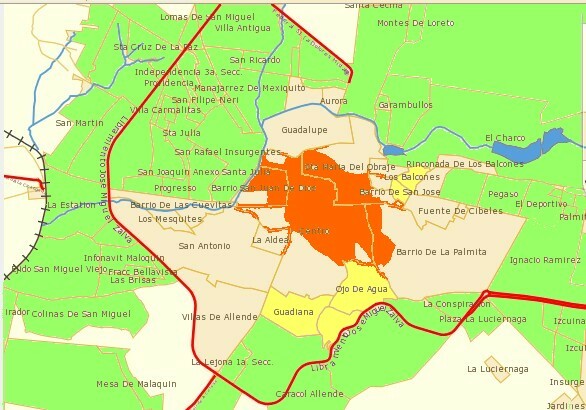 In San Miguel, not only are you what you eat, but you are also where you live. Cachet is measured in either distance from or view of the Parroquia. The most Cachet comes from living in Centro (SMA Red). Status comes from the amount of time it takes to walk to the Parroquia. If you rent your Casa then that walk is converted into minutes to denote status (only 7 minute walk to the Jardin). The next level of cachet (yellow) comes from your View of the Parroquia. It must be an unobstructed View. If you have to stand on a chair while your spouse holds your legs to see it then you are in the wrong part of San Miguel. There are mid points (beige) of Status between Centro and The View but there will either be a long walk or an obstructed view. The Gringo Free Zones (green) confer no status. In every Gang there is a pecking order. The Gang Leader is known as the Doyen or Doyenne. 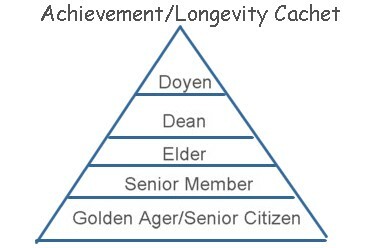 Ranking or stature in this Cachet is based on three criteria achievement, longevity and residency . Dean is the senior member, in terms of length of service, of any group. The status comes simply from outlasting everyone. Generally the activity is added to Dean – for example, John is the Dean of Drinkers at Mamma Mia’s. Jean is the Dean of Bridge Players at Real Minas. .
Senior Member – Senior Members are secretaries of San Miguel. They are the people who worry about chairs and who sits where and are responsible to make sure everyone is reminded of the next meeting. Golden Ager or Senior Citizen: This is anyone over the age of 65 and retired. They are the extras of San Miguel and are used to fill up pictures or empty chairs. Sometimes they are given some status by how old they are eg. Centenarian, Nonagenarian, Octogenarian, Septuagenarian, and the most popular Sexagenarian. There are people who live in San Miguel who never join a Gang nor want to join it. Their resistance to social pressure in San Miguel is disconcerting to Gang Members. They don’t reinvent themselves, they aren’t impressed by wealth, or beauty or how long you have lived in San Miguel. They have opinions that they rarely keep to themselves. In retaliation, Gangs use the following words to describe and dismiss them. Curmudgeon – a crusty irascible cantankerous old person full of stubborn ideas. This Cachet comes from having specialized knowledge or experience in art, history, archeology, architecture, anthropology, language, or literature to name a few. A guru is a person who is regarded as having great knowledge, wisdom and authority in a certain area, and uses it to guide others. A SMA Guru will be or says they were an expert in the particular field. For example, a Professor of English Literature becomes a Guru on Jane Austen or Romantic Poets. The Philistines of San Miguel don’t know that there is a difference between PhD and Md. They hear the word Doctor and their hearts beat just a little faster. To explain the difference is so complicated that anyone with a PhD in San Miguel simply pretends they were cardiologists. Docent or Cicerone is a trained volunteer museum guide. A docent is at once a volunteer, a teacher, and a guide. They become Docents simply because they love the word Docent even though they secretly fear it is reminiscent of the Yoda in Star Wars. 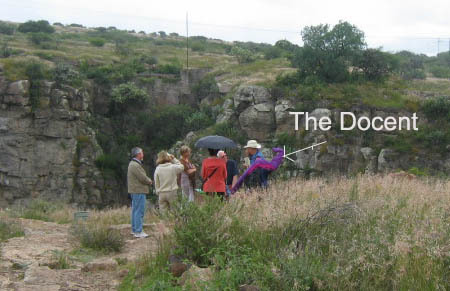 These are the people who conduct the Walking Tours of San Miguel or the House Tours of San Miguel or the Tours of El Charco del Ingenio. Guide is a person who takes visitors on tours of sites, such as museums, cities, wilderness areas, etc. and shares his knowledge about places, objects, or flora and fauna of interest. A SMA guide is an amateur who has read one book on the area in which they guide and hence become an expert. The next step down from a Guide is a Pilot. They don’t know anything but directions. So on a House Tour they are the ones standing in the Garden pointing the way. A Shepherd is sort of a spiritual guide. They wear long flowing robes and dresses and help those who are lost in San Miguel find their way. Guardiana, Los Balcones, Los Frailes, San Luis Rey, Calle Recreo. Here is quote found on a website, that illustrates Residency Cachet. She felt she had to escape the hostile audience fast when she ended. We took her out to an SPA garage sale to unwind. She’d been in SMA 20 years at that point.